Mr. Atul Pande, CEO Sports Business, Essel Group, said, It gives me great pleasure to announce the introduction of Ten Action+. 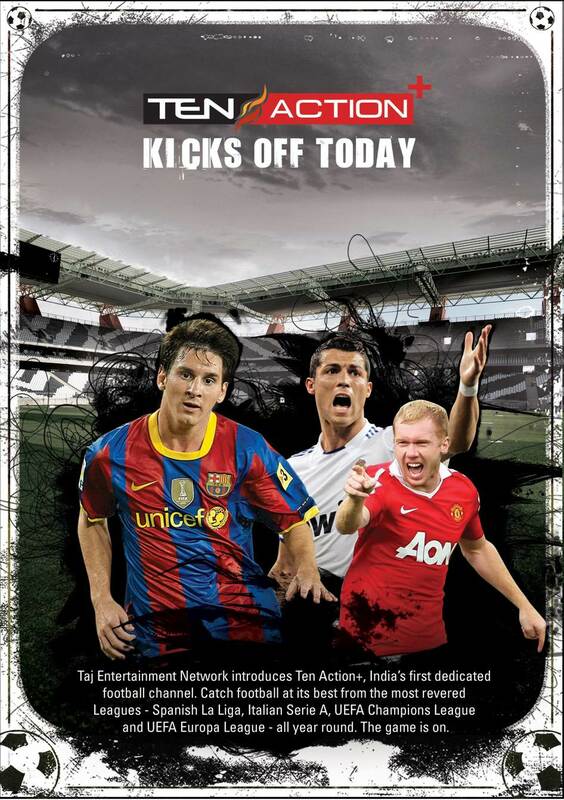 This channel will bring the best football action from around the world. Mr. Pande added, This affirms our commitment to grow the sports business and consolidate our position as the leading sports broadcaster. Entertaining and informative, Ten Action+ will showcase live and exclusive match action from the Spanish La Liga, UEFA Champions League, Italian Serie A, UEFA Europa League, English Championship, Carling Cup, Scottish Premier League and Dutch Eredivisie, among others. There will be a host of preview, review and magazine style shows along with original live studio programming before the best games kick off at the weekends. Ten's latest studio concept, Countdown 2 Kickoff (C2K), will follow all the football action every Saturday and Sunday and track breaking news, live scores, results, standings and fixtures from the numerous leagues. As an extra dimension, Ten's on air football experts will explain in greater detail the subtleties of the beautiful game with exact precision using the newly acquired Piero 3D virtual graphics package. Controversial goals, tactical play and disputed moments will be analyzed through the real time transition of live action into virtual reality together with a vast array of real time statistics. Plus, the footy die hards can keep up to date with all the latest team and player news from their favorite super clubs all week with the best club channel content from Chelsea TV, Liverpool TV, Manchester City TV, Barca TV, Real Madrid TV and Bayern Munich TV.